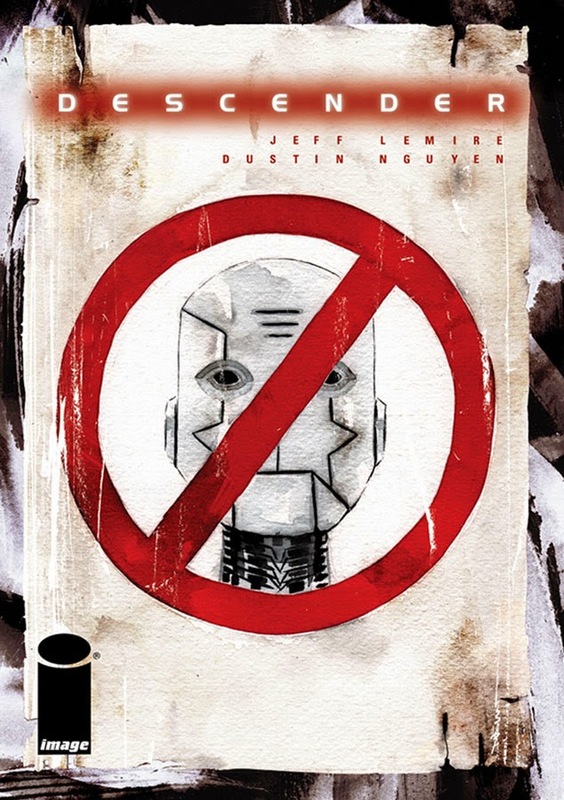 Descender #1 introduced us to a world decimated by mysterious "Harversters," robots the size of moons, who wiped out millions on the Nine Core Worlds of the United Galactic Council. The devastation created a backlash against robotic technology, outlawing robots to the point where robots were hunted down and destroyed. On a distant mining colony, a young robot, TIM-21, awakens to find his world destroyed, his human family included, and along with his robotic dog, Bandit, has to fend for himself as Scrappers, robot bounty hunters, have found his location when he came back online. Descender #2 picks up with Tim and Bandit on the run in this exciting and emotional science fiction space opera that has already demonstrated to be one of the best stories of the year. Jeff Lemire has the unique ability to tug at your heart while also making it jump out of your chest when he combines a chase scene with alternating flashbacks of TIM with his human family. And it's not your typical flashback set-up as they are memory files being rebooted in TIM's system. As he's being run down by the Scrappers and their vicious dog, we get to see TIM leave Dr. Quon and meet the Tavers family. Needless to say it's an endearing look at how TIM assimilated to his new family and became one of them in a lot of ways. It makes what happened to them all the more heartbreaking. And now alone except for his trusty robo-dog has to escape this vicious band of hunters. Already in less than two issues I'm fully invested in the story, the characters and the plot. I want to know what happens to TIM and want to know how his codex or "DNA" is related to those humongous machines that caused the massacre ten years earlier. First, I want him to survive this issue and if you're not shedding angry tears at the end of it you might be a soulless machine yourself. Lemire weaves a fantastic tale that is enthralling and ultimately intoxicating. You can't escape falling in the deep end of this emotionally charged epic. As far as the art goes, what else is there to say about Dustin Nguyen's magical touch? His watercolors add so much depth and character to scenes you can momentarily get lost in them, looking to see how he can create such beautifully haunting landscapes. He can turn around and make equally horribly fearsome monsters like those bounty hunters who are human but menacing and frightening. I've always graded artists on their ability to evoke emotions with the facial expressions of the characters and Nguyen can break your heart with a single panel. The flashbacks work because you can connect to those scenes based on the joy written on TIM's face and the Tavers kid. As well written as Lemire's script is it would feel hollow without Nguyen's empathetic art. Descender is the type of science fiction that is rare in its simplicity with more emotional heft than most comics on the market. It' the type of story that Steven Spielberg used to direct. It's one of the best comics of the year that will resonate all the way through award season. It is a must-buy. Get it now!